How to Modify Audios Using 3uTools? 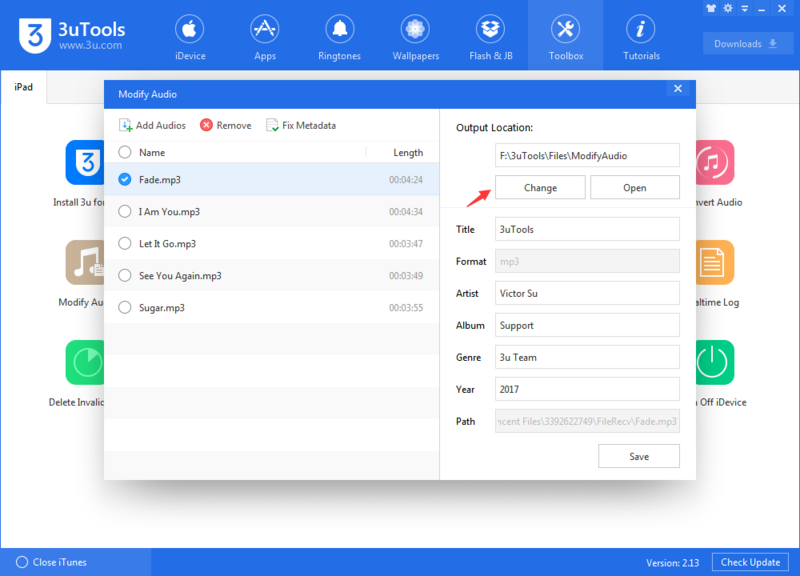 V2.13 3uTools add a new function on Toolbox that allows you modify audios. Let's check this new update. More updates please check What’s New in V2.13 3uTools? 1. Update 3uTools and launch it. Click Toolbox -> Audio Tags Editor. 2. Click Add Audios or drag the audios that you want to modify. 3. Select the audio you need to modify. On the right bar, you can edit title, artist, album and genre. After you finish it, please click "Save" to save the changes. 4. You can also change the location of the output audios by clicking "Change". 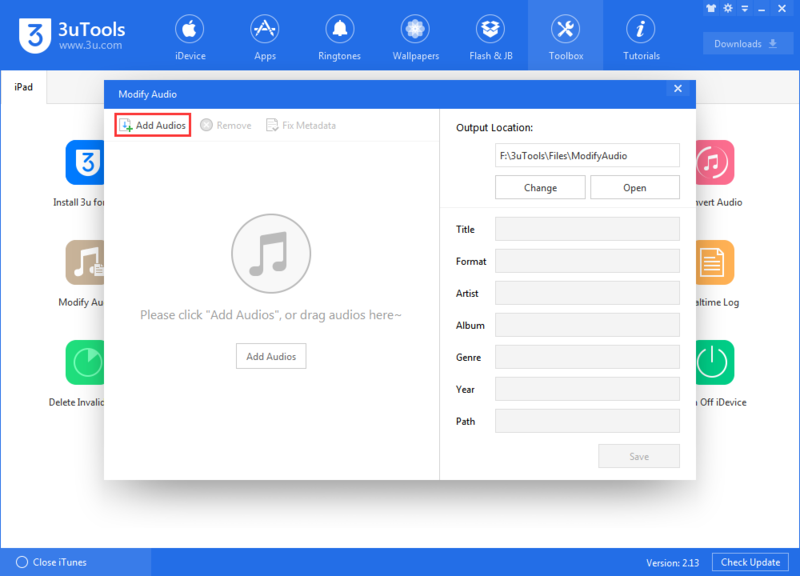 If you need to convert audio, please check this tutorial: How To Convert Audio Using 3uTools? Thanks for visiting. For more latest updates or supports, follow us on Facebook or Twitter. “iDevice is Connected, But Can’t be Recognized” While Using 3uTools? How to Solve the Frequent Operational Failure of 3uTools on Computer? 3uTools Frequently Prompts “Connection Timeout”? How to Download and Set Ringtone Using 3uTools? How to Use Back up and Restore in 3uTools? Failed to Export Photos Using 3uTools? Why It’s Failed to Delete Photos on iPhone Using 3uTools? 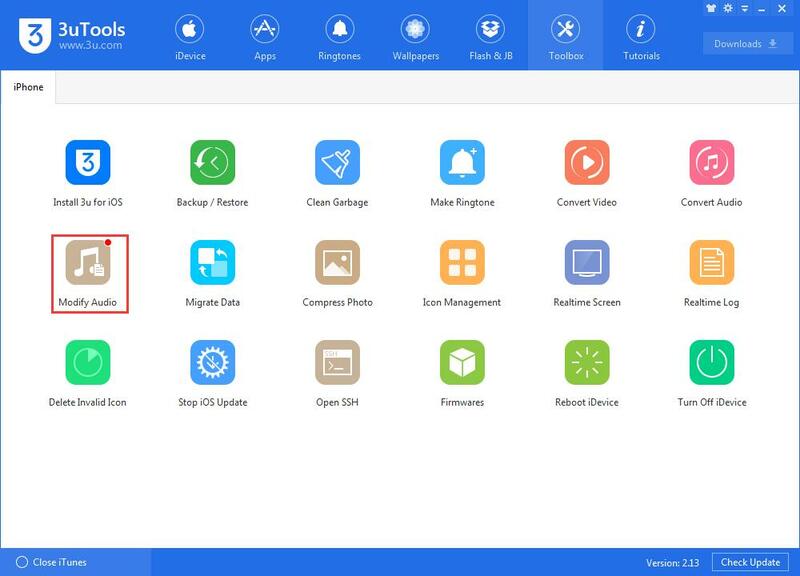 How to Restore a Disabled iPhone Using 3uTools?